Sounds delicious. Blue cheese teams so well with pear! Great ingredients make amazing dishes, and this is the perfect salad to showcase that! Love the flavors! Aren’t they amazing? Better than any fruit I could buy at the grocery store, that’s for sure! Yum! Great salad. I received those pears once and they are amazing! It was a great gift I wish I’d get again! 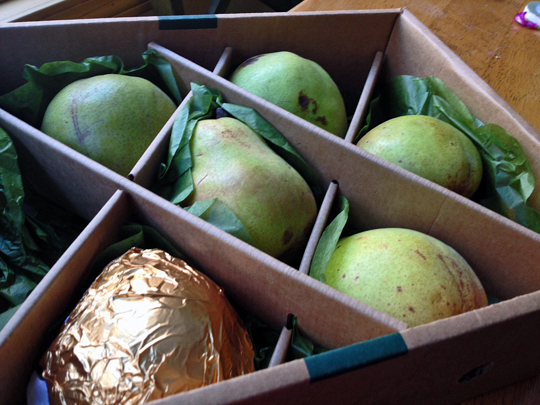 I am sad the pears are over… oh, well – nothing lasts forever! 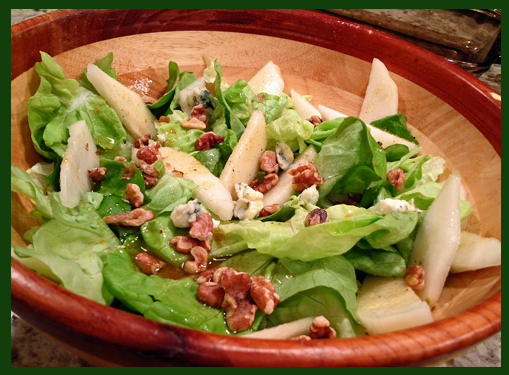 I’m intrigued by the combination of pears, blue cheese and, to a lesser degree, walnuts. I recently bought a small container of blue cheese (it’s too strong for me to eat straight but I love it with Buffalo Wings) that I wanted to combine with pears for a dessert. Then I had to throw away the pears cause they hung around a bit too long in my fruit crisper. When the weather gets better (as in STOPS snowing every other day now that I’m dug out) I plan to go out and pick up some pears and give a salad a try. I wonder if I can use Romaine instead of butter lettuce though. Very delicious salad… reminded me of another salad I made years ago with spinach and thinly sliced potatoes, crisped up on top of the stove. Sounds odd, but it was amazing…. What a great present to receive! Love the idea of living food as a gift; will have to investigate that next year — glad you mentioned the company. This is one of our favorite salad combinations Sally — toasted nuts and blue cheese — a heavenly pairing that never fails to make everyone swoon. The kids love it too. I have not tried walnut oil (I don’t think) but yes, all of those ‘fancy’ oils are tragically expensive, aren’t they… (mind you, probably less expensive than your beloved saffron 😉 ). Hello sweet friend. What a beautiful salad. Aren’t pears and walnuts just splendid together? Especially when you throw in a lovely vinaigrette. I love receiving and giving living food. Such perfect gifts, huh? Thank you for sharing! Hello back to you! Nice to “see” you here, in the middle of what I imagine is a pretty busy weekend for you with the beginning of your new job! Hope all is going great! I generally don’t crave salads either, but this sounds like it’s full of flavor and with the pears taking center stage…I’m sure it is fabulous. It’s hot, it’s sticky and all I want to eat are salads and things cool. I want your pear, blue cheese and walnut salad. I think it sounds so good! What a wonderful winter salad! So refreshing! I love all the flavors going in here, especially the use of champagne vinegar! The Harry and David pears are absolutely the best, aren’t they? Love what you’ve done with them here, they are SO good with blue cheese. I DVR’d Before Midnight the other day and plan to watch it this week!!! I’ve been waiting. I love those movies Sally. 🙂 I love the combo of flavors in this salad. Mike typically turns his nose up at blue cheese though. I’ll have to find a suitable substitute for him, but as for me, I’d devour it!